by Susan Ioannou, "The Mining Poet"
Much past Canadian poetry described our people and landscape in lyrical terms. 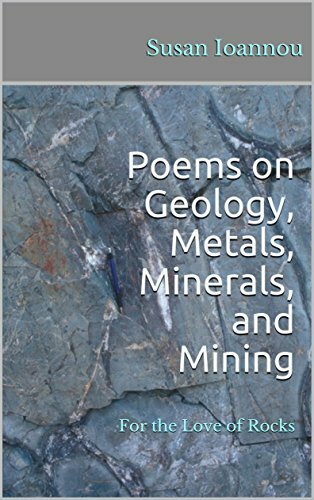 Combining research and wonder, Looking Through Stone burrows deeperthe first collection of poems in Canada devoted exclusively to geology and mining. Quite literally, it goes underground. From volcanoes to vitamins, the book presents a wealth of factual information. It also explores past, more fanciful notions about how rocks and minerals fit into our human picture. In its 107 pages, science and imagination meet. Part I introduces a little basic geology. Part II focuses on the seven metals of the ancients, linked to the planets and days of the week, plus platinum and uranium. Part III delves into myths and legends about the power of gemstones. Part IV looks at the history and technology of mining, and its social and economic impact. The minerals included in Looking Through Stone are all to be found in Canadaa reminder of our country’s rich resources. First publication (ISBN 978-1-896350-22-6, 2007) was in mining country, Sudbury, Northern Ontario, by Your Scrivener Press. In addition to traditional readers of poetry are many in the resource and mining community. The Prospectors and Developers Association of Canada is including Looking Through Stone in its Mining Matters educational program. Also, it is being used in conjunction with the Specialist High Skills Major in Mining curriculum, developed by the Sudbury, Northern Ontario, Rainbow District School Board. Teachers and students can download the free, 15-page PDF Glossary, offering simple definitions of the geological/mining terms and historical/mythological references in Looking Through Stone. 7 A grand continuum . . .
AuthorsAloud: Susan comments and reads “Geologist”, “The Link”, “Haiku”, “Amber”, and “Engineers”. 107 pages, ISBN 978-1-896350-22-6, $17.00SOLD OUT. eBook Literary Edition, with glossary (Wordwrights Canada, 2010), eISBN 978-0-920835-34-0. Expanded Paperback Edition, with glossary (Wordwrights Canada, 2017), 144 pages, ISBN 978-0-920835-50-0.
eBook Industry Edition, with glossary (Wordwrights Canada, 2017), eISBN 978-0-920835-51-7.